Today, MDAC and Mental Disability Rights Initiative - Serbia called on the Serbian Government to take immediate steps to implement recommendations it recently received from the UN Disability Committee. MDAC and MDRI-Serbia call for "urgent steps" to tackle abuse and institutionalisation in Belgrade. © MDAC. Serbia has a long history of disturbing cases of death, torture, neglect and total social exclusion of people with disabilities. Criticism has been expressed for many years at both national and international level. In April, the UN disability committee called on the Government to take concrete steps to improve the human rights situation of people with disabilities. Today, we call on the Serbian Government to end mass institutionalisation of people with disabilities and to abolish the system of guardianship which affects around 20,000 people in the country. Two week ago, S.T. died in the Veternik institution. His life and death should be a wakeup call for the Serbian Government. He lived an invisible life, excluded from society and died a horrible death: burned in an isolation room just two metres square. He was just 22-years-old. We have been monitoring institutions for more than ten years. Abuse, violence and neglect are daily occurrences at institutions such as Veternik. All institutions need to be closed and the Government must act to ensure that all people with disabilities can be included in the community, as is their right. Stopping further investment in institutional care, redirecting financing to community based services. Deprivation of legal capacity has a huge impact on the daily lives of people with disabilities. It strips them of their rights and freedoms and endangers their autonomy. It can mean they are locked away against their will, subjected to invasive treatments without their consent and are not able to marry or found a family. Monitoring and reports from various organisations state that many women with disabilities, especially those in institutions, are subject to invasive and inhumane practices such as having intrauterine devices (IUDs) forcibly inserted to them, forced contraception and forced abortions. A.B. and G.A.H. had their daughter taken away from them because the mother has an intellectual disability, which for some means she is not good enough to be a parent. They have been fighting to get their daughter back for two years now – without any success. The current system treats the mother as someone who is incapable of being a loving parent simply because of the label she has been given. We urge the Ministry of Health to prohibit medical interventions and procedures on people with disabilities without their free and informed consent. We urge the Ministry of Justice and other relevant authorities to immediately start law reform. People with disabilities should never be deprived of their legal capacity or placed under guardianship. Instead, the Government must establish a system where people with disabilities can access support in decision-making should they need it. 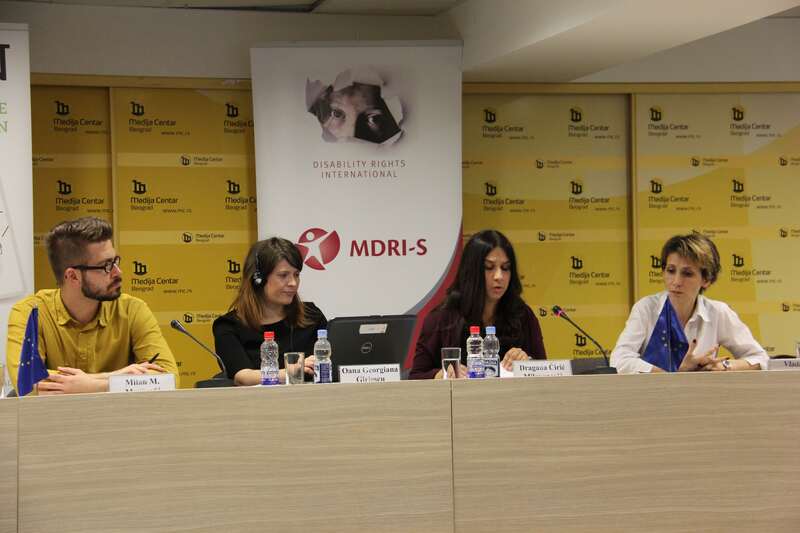 Mental Disability Rights Initiative of Serbia (MDRI-Serbia) is an advocacy organisation dedicated to the human rights and full participation in society of children and adults with mental disabilities in Serbia. For more information, visit www.mdri-s.org. MDAC is an international human rights organisation which uses the law to secure equality, inclusion and justice for people with mental disabilities worldwide. For more information, visit www.mdac.org. Serbia was reviewed by the UN Committee on the Rights of Persons with Disabilities in April this year (CRPD Committee). The CRPD Committee assess progress made by States in implementing the UN Convention on the Rights of Persons with Disabilities (CRPD) which Serbia ratified in 2009. The CRPD Committee’s final report, known as ‘concluding observations’, can be found here.